Mass behavior control via electromagnetic manipulation of the ionosphere. As LBJ’s Science Advisor, MacDonald surely knew of the military’s weather modification program known as Operation Popeye, which ran from 1967 thru 1972 in Vietnam, Laos and Cambodia. By seeding clouds, the US military caused torrential downpours that inhibited enemy truck and troop movements. Initially exposed by investigative journalist Jack Anderson, the existence of the project was later corroborated in The Pentagon Papers. Pragmatically, the US wouldn’t be worried about such weapons unless they knew with certainty that they were feasible and had, in all likelihood, already developed them itself. 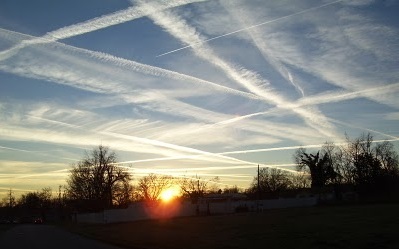 To claim that solar radiation management methods (which include chemtrails and HAARP-induced changes) are “unimplemented and untested” is patently absurd, and contradicts a library of evidence. On March 26, 2013, the US Patent and Trademark Office granted a patent to Rolls-Royce PLC to prevent contrails from forming. 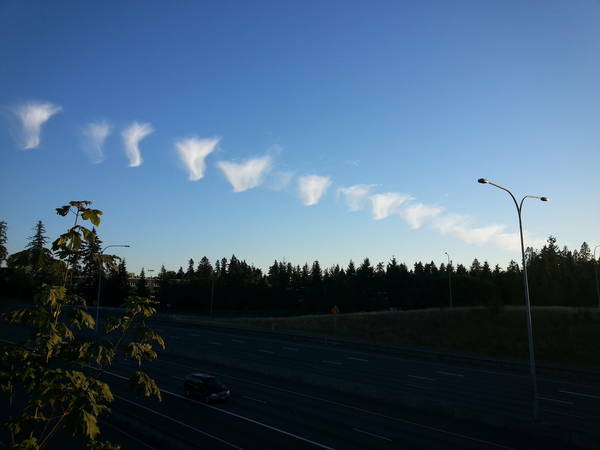 By using an electromagnetic wave generator, contrails would not be visible, nor would artificial clouds develop. It’s not the first such patent. Back in 1962 the US Air Force wanted to add caustic chemicals to hide contrails and prevent unintentional cirrus cloud formation. Patent No. 3,517,505 was granted eight years later, in 1970. Patent, No. 5,005,355, granted in 1988 to Scipar, Inc., used various species of alcohol, which effectively lowered the freezing point of water to avoid contrail formation. The 2013 patent characterized both of these earlier patents as environmentally inappropriate for commercial purposes. 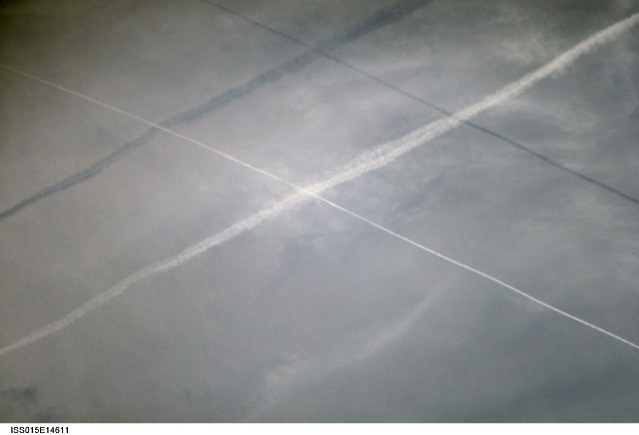 What some see as chemtrails, the IPCC and others recognize as persistent contrails that are a normal effect of today’s jet exhaust. The reason today’s jets now form persistent contrails, explains Marshall Smith, a former NASA-Ames aeronautical engineer, is that the sooty particulates in older jet exhaust provided a nucleus around which ice crystals would form (giving us a contrail). But because of its dark color, the sooty particulate absorbed solar energy which melted the ice crystals, dissipating the contrail. Today’s cleaner and thus clearer jet exhaust allows solar energy to pass right through it, and so contrails persist and spread into high cirrus clouds lasting 24-36 hours. 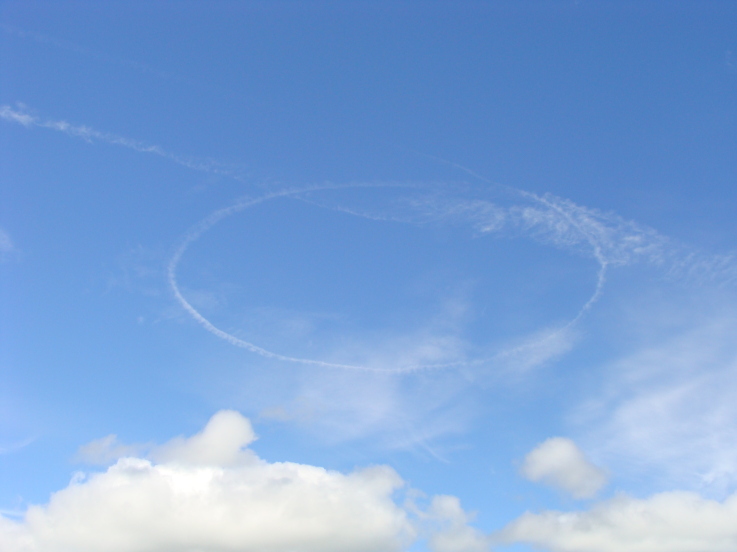 The dot-dash effects seen in the sky, Smith explains, are the result of the jet exhaust passing thru sections in the atmosphere that are warmer, creating a broken line or dotted contrail. The following image makes that explanation implausible. Instead, it illustrates that as the plane passed, an on-off switch was thrown several times. It’s hardly likely the ambient temperature and humidity uniformly varied where the plane traveled. 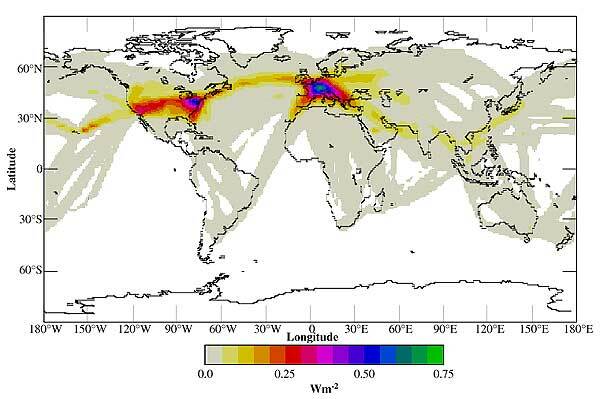 Global distribution of net instantaneous radiative forcing at the top of atmosphere in daily and annual average for present (1992) climatic conditions, analyzed contrail cover, and 0.55-µm optical depth of 0.3 (Minnis et al., 1999). However, the high-bypass turbo fan and better grade fuel do not explain the grid pattern often seen which is clearly not normal air traffic lanes. Below are two images showing the grid pattern. The first, a generic one found on the web , is one of many such images uploaded by concerned citizens who reasonably fail to recognize a normal set of flight lanes. Unless lab results prove otherwise, these webs are natural and should remain outside the chemtrails discussion. Weather Warfare also spends a good deal of time covering the international agreements against environmental modification (ENMOD). The first major one came in 1978, after the US was exposed for weaponizing weather during the Vietnam War. Smith points out that none of these agreements cover “national defense” which is how governments are able to avoid the ban. That 1978 agreement specifically objected to hostile use of ENMOD. In 2010, the UN banned friendly ENMOD. The 193-member Convention on Biodiversity agreed by consensus to a moratorium on geoengineering projects and experiments, which governments promptly ignored. With no teeth to that moratorium, it’s not too surprising that such programs continue unabated. But de facto moratoria already exist for such projects, as mentioned above, and Kintisch lists some others, including the London Protocol, the London Convention and a German restriction limiting iron-seeding to coastal waters only. The only element missing in Kintisch’s reasoning is his refusal to believe that governments have already gone underground with it and that geoengineering is already underway. Kintisch, like all government propagandists, wields the “conspiracy theorist” label like a club, without once offering any logical counter-argument to explain what thousands of sky watchers have observed and documented with photographs, videos, and soil and water tests. Conspiracies are argued and decided by the thousands in courts all over the world, every day. Most crimes are not committed by lone actors, yet condemning those who recognize a conspiracy pattern has become a simple and lazy way to crush investigation into inconsistencies in government position statements. Bradley Manning, Edward Snowden and Wikileaks, along with Daniel Ellsberg, Karen Hudes and W. Mark Felt, certainly prove that governments are the most dangerous conspirators facing humanity today. Though he offers dozens of reasons why geoengineering the planet would be a bad idea, Kintisch comes out in support of the notion, likening it to a terrarium, “an enclosed controlled garden,” leaving the reader with a sense that planet hacking is a necessary evil that should be regulated. Already closely tied to the military, how easy would it be for Monsanto to know in advance of a geoengineered drought or deluge? Monsanto expects its climate insurance business to generate $20 billion in revenue beyond its seed and chemical business. Likewise, how easy would it be for a nation with decades of experience in modifying the weather and in triggering geophysical events to create the problem of climate change (or exaggerate its significance) to induce the world into approving, even demanding, geoengineering? With decades of patents providing a history of capabilities, could this entire drama, including “extreme weather events” be orchestrated for the simple pursuit of profit? Isn’t this precisely how the Hegelian Dialect works? Problem→Reaction→Solution (Thesis→Antithesis→Synthesis). In other words, those in a position of power invent a problem, anticipating the public’s reaction to it, and use that reaction to generate demand for the “solution” which was the intended program power-holders wanted to implement in the first place. At the very least, while the veil may be lifting on geoengineering practices, there is still an apparent effort to conceal the extent to which the planet is already being engineered. Eli Kintisch, Hack the Planet: Science’s Best Hope or Worst Nightmare for Averting Climate Catastrophe. John Wiley & Sons. 2010. Jerry Smith, Weather Warfare: The Military’s Plan to Draft Mother Nature, Adventures Unlimited Press: 2006. This entry was posted in Environment, Geoengineering and tagged AR5, chemwebs, climate change, eli kintisch, HAARP, hack the planet, ipcc, jerry smith, nick begich, rosalie bertell, weather warfare, william s cohen. Bookmark the permalink. Thanks for the information. How did George Orwell figure out serfdom was our fate in 1946 when he started writing the futuristic novel, “Nineteen Eighty-Four”? The first scientist to visit Hiroshima’s ruins in August 1945, Professor P. K. Kuroda, designed a research project to reveal the answer in 1960. See: “A Journey to the Core of the Sun” (in progress). I have now started writing Chapter 2, knowing without doubt there is more validity in the conflicting opinions of a dozen skeptical scientists than in the consensus opinions of thousands of text-book authors, well-funded and tenured professors and Nobel Prize winners. As the world braces for a possible direct hit from the Sun today, the National Academy of Sciences and the Royal Society may start to realize that their united efforts to hide the source of energy in cores of U and Pu atoms that destroyed Hiroshima and Nagasaki on 6 and 9 August 1945, . . .
Have blocked our knowledge and increased our vulnerability to the same source of energy in the core of the Sun.